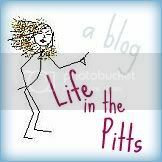 Life in the Pitts: I don't remember this. Because I was sleeping. HAHAHA Oh my gosh that is so funny! My husband talks in his sleep ALL the time! I wrote about it back in september on my blog I think... ? But yea, its awesome to watch. He always thinks spiders are crawling on him. It's crazy. Guffaw, chortle, wheeze, gasp, giggle. hahahaha!!!!!! that's awesome. when i was in high school, my friend and i took up jogging every morning at 6 am. well after the first day, she woke me up, apparently i *quote* growled at her like a gremlin *unquote* so she wouldn't wake me up anymore. my jogging career was short lived due to my love of sleeping.